Just wondering if there is a way for me to share the AD assets that I've added to the app on my laptop so they also appear in the app on my desktop. I've added a load to the assets panel on my laptop, but when I opened the app on my desktop this morning, none of them were there. Guess it's because it's app based and not cloud based. Is that right? Is there a way of saving them and uploading from one to the other? You can export the assets from your laptop version by clicking on the menu icon on the assets panel and selecting Export (as shown in attached screenshot) This will export out a .afassets file which you can then copy onto a Cloud drive or USB storage and then using the same menu on the assets tab on the Desktop, you can then import them. Thanks so much for that. I knew there must have been an easy way to do it. Just getting my head around all the fab features and didn't want to spend hours looking for a solution. Appreciate your quick response! Would be cool to change the storage option of Assets to such as DropBox, Mega etc. so they are synced to all your Affinity designer versions. 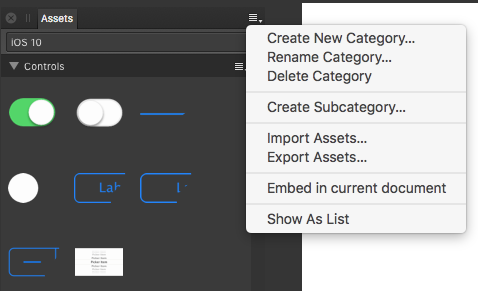 Note that the export & import must be done separately for each category -- AFAIK there is no official way to do all of them in one operation. What might work for doing this in one shot is to copy the assets.propcol file from the laptop to the desktop, overwriting the original, but this is an unsupported, 'try at your own risk' thing that should not be attempted without a good backup of all of your Affinity Designer per user files! Think I'll do the long haul thing. Not sure I'm confident enough to take any risks with it at this stage of my learning curve. So how should that work if one instance of the app is on a computer that has no internet access when the app on it is in use? A cloud-based sync of the local copy might be better, particularly if it was something a user could choose if or when to do that, & there was some simple way to resolve the differences that might occur if the local copy was modified when the internet was not available. Dropbox is cloud based but I've just used Dropbox and Mega as an example for both Mac and Windows users alike, I'm sure Mac users would easily benefit from such an option. there was some simple way to resolve the differences that might occur if the local copy was modified when the internet was not available. Many apps seem to be able to cope with modified files from one computer to another so I can't really see that being much of an issue. But I still wonder if this would be suitable for something as complicated as a file containing what could be hundreds or even thousands of assets in a great many different categories. There must be at least some local storage for when the internet is not available; otherwise there would be no assets available at all. And that makes syncing with the cloud-based asset resources complicated if, for example, an asset or category is added locally to the app while it is running on a computer that isn't connected to the cloud when it eventually is. There could be namespace collisions or several different versions of the same asset, & that would have to be resolved somehow. Fair points, but I'm sure if such a thing was to be considered the dev's would eliminate most if not all of those issues with a first release. Having a central sync space that updates a local source would be a bonus if done right. I doubt there are many instances where the lack of an internet connection would be a hindrance, if only for the short term, I would suspect that syncing would be done when one had access to a WIFI port, that could be pretty much anywhere in the modern world and even in such places as internet access is not readily available it would be available at some point. If you were working on a project and required an Asset that say somebody else had created or added, you would be in communication with them anyway and would find an access point to facilitate asset transfer. Internet access is a workaround problem that would be dealt with by the Asset Access'ee, As the saying goes, " Where there's a will, there's a way". Fingers crossed this might become a thing! Would be great if it could. Thanks all for your input. Seems like a good idea. Creative Cloud 'needs' an internet connection to update assets files, but they're still there when offline! Would be great to be able to use something like Dropbox / OneDrive / etc to achieve this. I agree about the concern of many assets being synced, but I am sure a lot of people work like me - desktop in the office/studio, and laptop 'on-the-road'. Using laptop for tweaks in client meetings!